We interrupt this wicked Polar Vortex to bring you exciting news that will impact your future summer bucket list. There's nothing better than making a visit to the best beaches for kids near NYC, but warm-weather outings are about to become a lot more convenient. 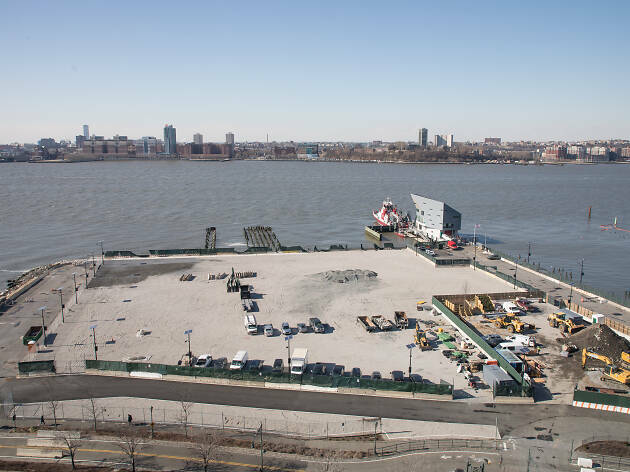 On one of the coldest days of the season, news broke that Manhattan's first public beach is in the works at Hudson River Park. According to a press release, James Corner Field Operations—the masterminds behind Domino Park and the High Line—will work the Gansevoort Peninsula’s 5.5-acre public park, which is set to include "passive and active recreational areas and what will be the first soft edge or beach." The release also indicates that this will be the largest greenspace in the park. Naturally, New Yorkers are ready to rock 'n roll with this exciting plan. "We've been able to showcase some of the best landscape architects in the field,” Madelyn Wils, president and CEO of the Hudson River Park Trust, said in a statement “I'm pleased that the exceptional design firm James Corner Field Operations will join the ranks of the talented teams that have helped make Hudson River Park one of the great waterfront parks in the country." There's a lot to look forward to with the impending plans. Although swimming might not be likely, there will be waterfront access and a protective barrier to combat storms and flooding. The Estuary Lab—a hit for the kiddies, especially when summer camps kick off—will have closer access to the water, which will be incredibly beneficial for all educational programs. And for those who love walking through galleries, artist and native New Yorker David Hammons will feature “Day’s End,” the Whitney Museum of American Art’s proposed in-water art installation. Now there's no need to choose between a day outside or inside exhibits. The project site, which is located along western end of Little West 12th St, will begin construction next year with the hopes of a 2022 opening. It seem like quite a ways off, so in the meantime, make sure you check out these cool indoor water parks.